Over the winter, we have started to roast various vegetables in the oven. Cauliflower, broccoli, carrots, even cabbage. The roasting method adds so much flavor to these veggies while keeping their nutritional value intact. 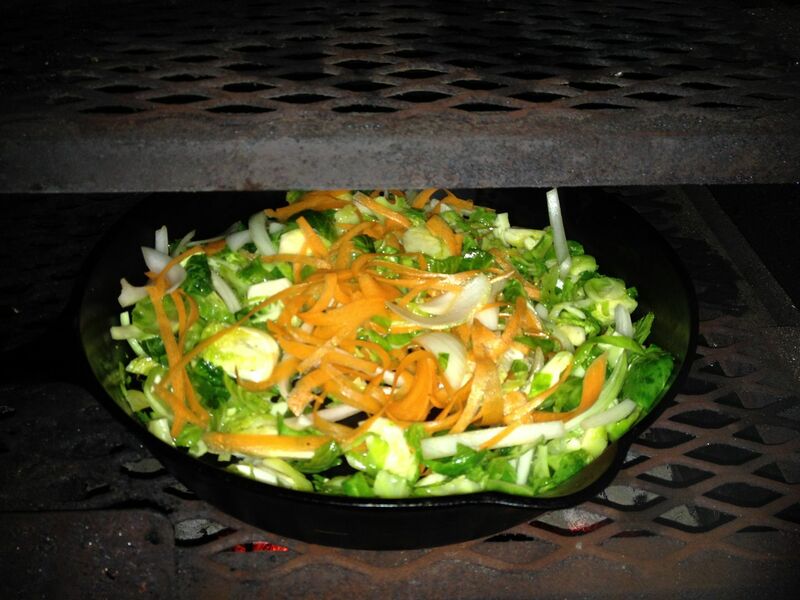 Since the grilling season has started, I have taken to roasting our vegetables on the grill with a large cast iron skillet. There is even more flavor with the wood fired tasted. So, the other day, we had some brussels sprouts in the refrigerator that were rapidly approaching their expiration date and I needed some ideas for dinner. I was in need of an Asian fix. So, I decided to try my hand at a stir fry on the grill. Before preparation of the main ingredients, I prepared the stir fry sauce so that the ingredients would have time to mingle. 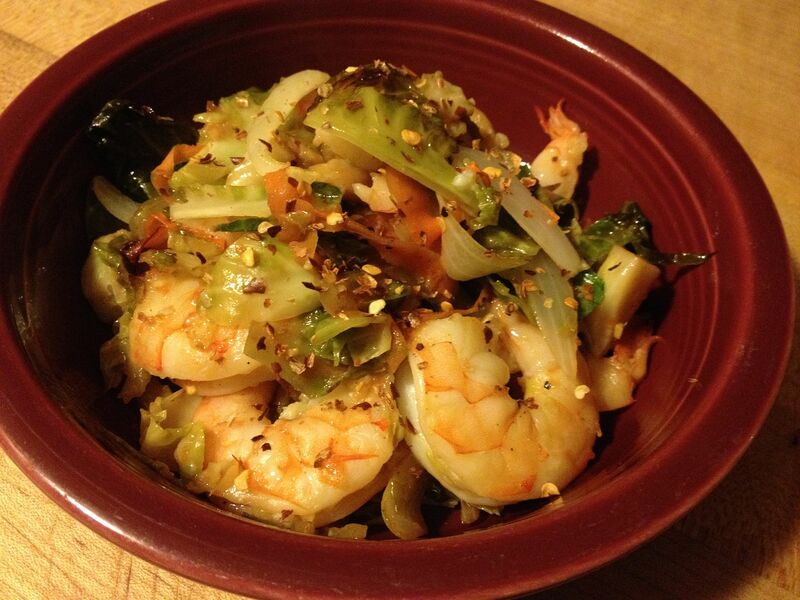 Then, Hope peeled and deveined the shrimp. I prepared the sauce and vegetables. For trimming the brussels sprouts, I just cut off the base then cut once lengthwise. Then, I laid the halves flat and sliced lengthwise. When you cut the base off, you can lose whole spout leaves. Throw those into your bowl. They become crispy, caramelized goodness. Once the spouts are trimmed, put them in a bowl and toss with the olive oil and some salt and pepper. I lit some charcoal and when ready, I dumped the hot coals off to one side. 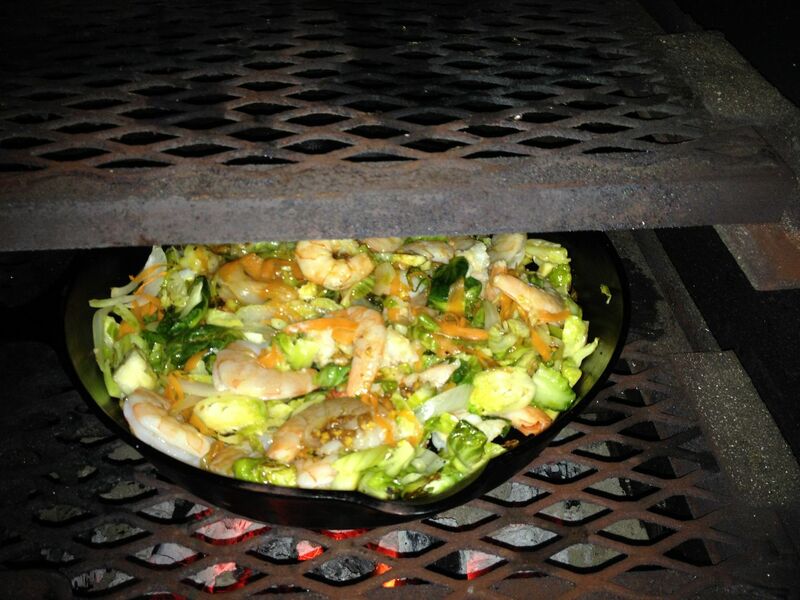 Then, I placed my brussels sprouts in the cast iron skillet, placed indirect heat, and closed my grill lid. After 15 minutes, I added the carrot and onion and stirred to incorporate into the mixture and placed the skillet directly over the coals. I closed the lid and let cook for five minutes. 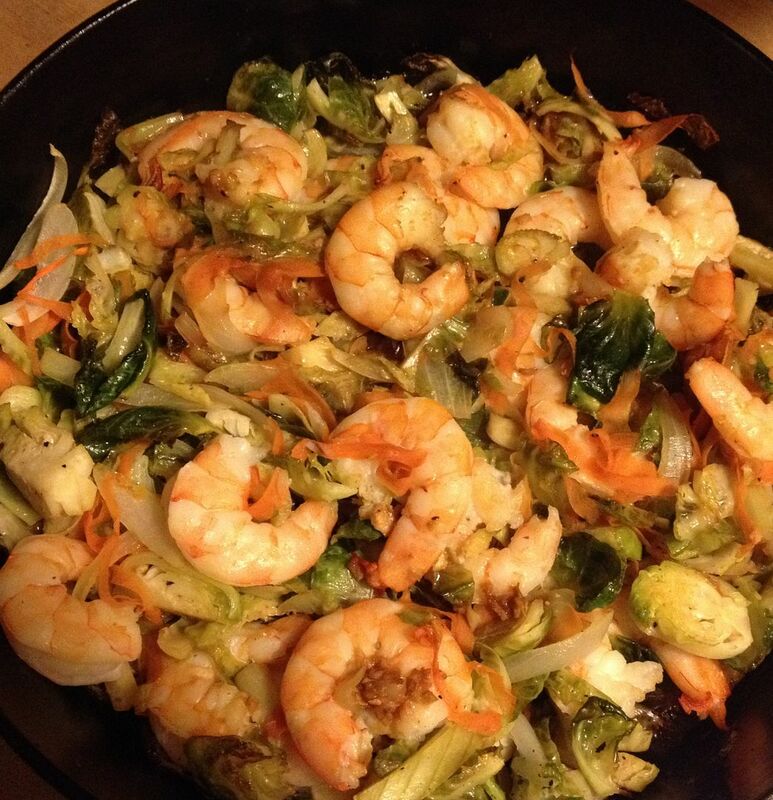 Then, I added the shrimp, closed the lid, and let cook for five more minutes. Finally, I added the stir fry sauce and stirred well. Then, closed the lid and let cook for one more five minute period. I added hot pepper flakes to my bowl for a little heat. The shrimp were cooked perfectly. Not rubbery, nor mushy. Some of the sprouts were crispy and caramelized and others where that perfect tender crisp consistency. The amount of sauce added was perfect. The wood fired taste just added to the flavors. A great meal for a quick dinner. If I had the change one thing, I would cook the brussels sprouts over direct heat and cut the cooking time down to ten minutes for the first step. I feel that this would increase the ratio of crispy and caramelized spout leaves and who doesn't want more of those? That is an interesting combination. 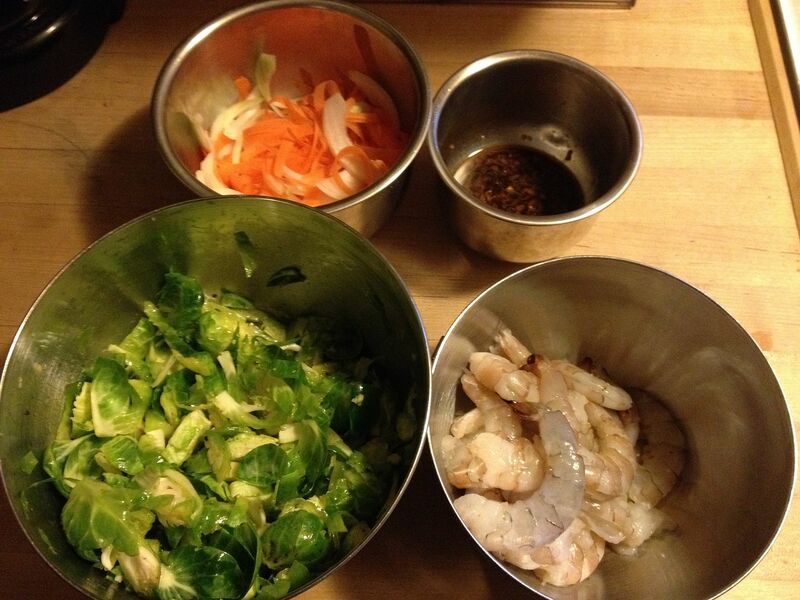 Brussel sprouts can be a little challenging. I have mixed feelings about them.Your dish may be the ticket. I like sprouts in any form Chilebrown. This dish did not have that brussels spout taste. Pretty good if you ask me.